More figs from our tree and what to do? I never made any jams this summer. I kept thinking I would get to it, but it never happened. So, fig jam it is. It's definitely fall outside now, I've got a beef burgundy in the oven, and I'm watching a little NLF Playbook. Jamming in between is just the right addition. Cut the stems off the figs and discard. Cut the figs into ½" sized pieces. Use a vegetable peeler and remove the yellow part of the peel from the lemon. Cut the peel into matchstick sized pieces. 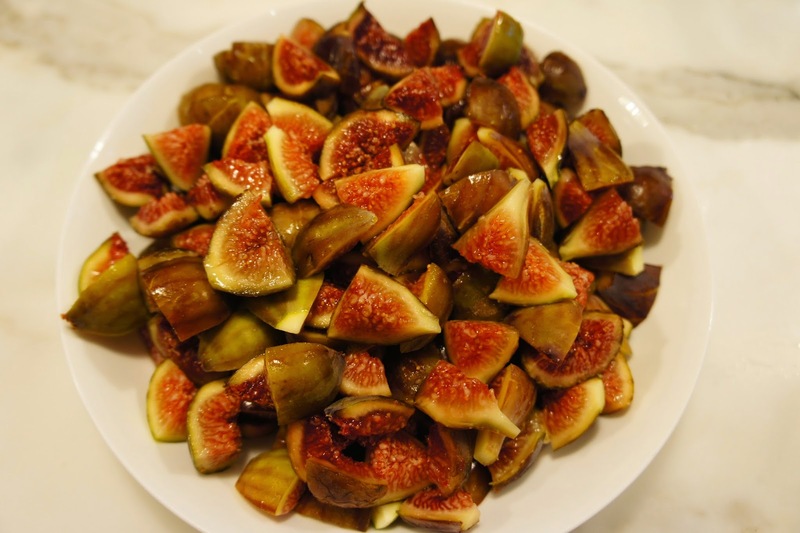 Combine the figs, lemon peel, lemon juice, sugar, cognac and salt in a heavy saucepan. Stir together and let stand at room temp for about an hour. Stir about every 15 minutes. Bring the mixture to boil over medium-high heat. Turn the heat down to medium and continue to cook until jam thickens, about 25-30 minutes. Remove from heat. Ladle the jam into clean jars. I boil them before filling them and leave them in the hot water until ready to use. Cover the jars with the lids. Place jars into boiling water for 10 minutes. Let jars cool completely. Store in a cool dark place for up to one year. Fall is beautiful here in Seattle. We've been having sunny but cool days which are my favorite. My summer vegetable garden has been cleared and garlic has been planted for next year. And something special has happened. After 4 years, my fig tree is finally producing ripe figs. On an early fall day, several years ago, I was on a walk with a friend when an elderly woman, who was outside gardening, asked if we wanted to try a fig from her tree. She plucked two large ripe figs from the tree and they were amazing. I was getting a fig tree. Since planting my Turkish Brown fig tree, it has only produced tiny figs which never seemed to ripen and would remain green and hard until they fell off the tree. It started out as a small three feet tall sapling. It grew quickly and I've trimmed it back the last two years wanting to keep the tree smallish and manageable. Now, when I had given up expecting any figs from the tree, we have been rewarded for our patience. When Stella saw the colander of figs on the kitchen counter, and found out they came from our tree, she picked one up, squeezed it gently and said with glee, "they're so soft and plump!". She then did a little happy squeeze of her hands and floated away. Oh happy day. I must find a way to incorporate them into our dinner tonight. Yesterday, while talking to the man at the fish counter about the paella I was making last night, we got into a discussion about chorizo. This led to him describing to me a chicken stuffed with Cotija cheese and green chilies and topped with chorizo. Sold. I'm thinking there's probably more to the chicken than we so quickly covered and it was definitely not supposed to be served with figs, but I had to work them in somehow. Make a sideways slit with a sharp knife into the middle of each chicken breast, cutting through until you reach near the other side, but not all the way through, to make a large pocket. Mix the Cotija, chilies and diced chorizo together. Stuff each chicken breast with the Cotija mixture and seal the opening with toothpicks. Mix together the flour and seasonings. Coat each chicken breast with the flour mixture. Heat a large skillet over medium high heat. Add 2 tablespoons of butter or olive oil. Add chicken, skin side down first and brown the chicken completely. Place chicken onto a large baking pan and place in the oven. Bake for 15-20 minutes until chicken is cooked through and the Cojita is melted. Place figs onto a baking pan lined with parchment paper. Drizzle figs with good quality balsamic vinegar. Top with some grated Cotija cheese. Sprinkle with just a wee bit of cayenne pepper and finish with freshly ground black pepper. Use the broiling function on your oven and place the pan under the broiler for a few minutes until the figs shrivel just slightly and the cheese melts. Serve chicken with the figs and a few slices of chorizo.